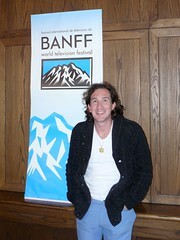 It was my pleasure to interview TiVo CEO Tom Rogers when he was at the 2010 Banff World TV Festival. In the interview, Tom and I talked about TiVo’s relationship with the advertising industry and television networks. When people are fast-forwarding commercials using technologies like DVR, television “needs to find different forms of inventory that involve different technologies as a way to present that [advertising] so that the advertising is compelling”. Tom gave the example of TiVo’s ability to pause live TV, so viewers can search and find any products appearing in a TV show (a sweater worn by an actress, a golf club used by an athlete, or any products on screen at the moment) and then turn the thought into an actionable transaction where the viewer can buy the product. TiVo is putting a lot of meta data into the TV content and movie content and in doing so, create a lot of “transaction opportunities”. 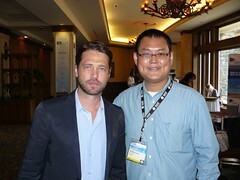 I also asked Tom When will TiVo come to Canada? And will the data collected by TiVo be transferable to Canada and other countries. Here is Tom’s Banff bio. ‘MILLIONAIRE’ AFTERMATH: WHY DO STUDIOS KEEP LOSING LAWSUITS? Perhaps studio execs should start volunteering for jury service. Wednesday’s $270 million verdict against the Walt Disney Co. over profits from “Who Wants to Be a Millionaire” is part of a trend that should have Hollywood heavyweights worried: Juries lately are skeptical of so-called “Hollywood accounting” — and are not hesitant to award huge damages to creative types who cry foul. 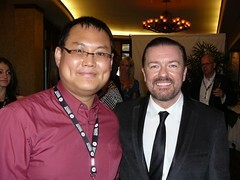 The following is red carpet interviews with Ricky including my question to Ricky about the finale of Extras (highly recommended funny comedy). The following is Ricky‘s speech and a brief clip after receiving his award. This is part of the amazing scene from Extras I love so much and a very insightful and enjoyable interview “Ricky Gervais in His Most ‘Postmodern’ Interview Ever“.